One seed can start a garden, one candle can light a room, one step can begin a journey, one conversation can start a friendship, one smile from a handmade card can lift one's SPIRIT! Welcome to another CAS Christmas Challenge where Nance is looking for our elf on the card! 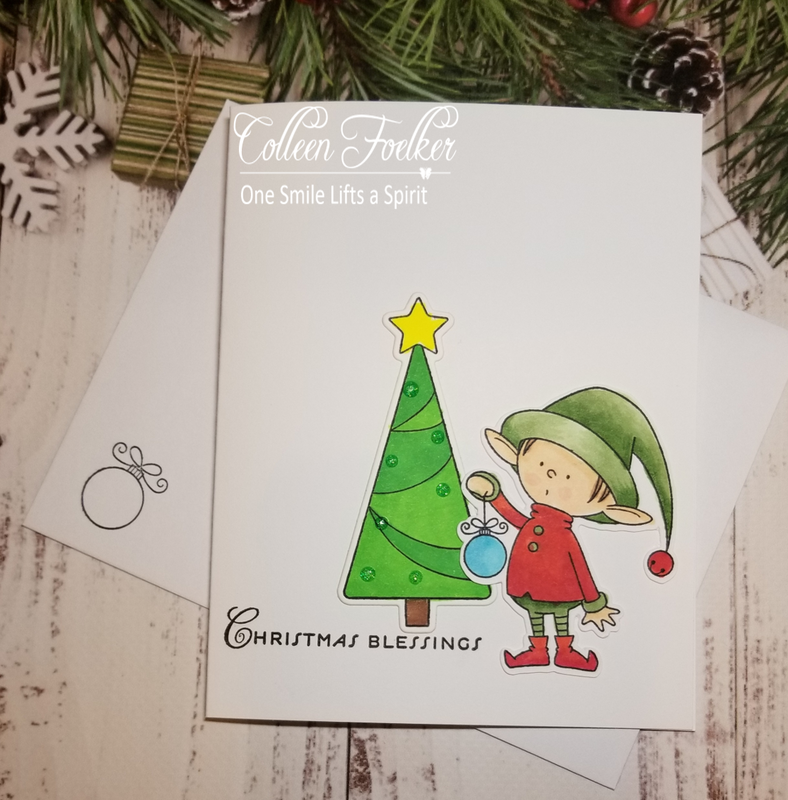 This is a new to me set from SSS called Naughty or Nice colored with copics and a little WOS for some sparkle and shine! You still have time to join in the fun and make a Christmas card this month with your elf! 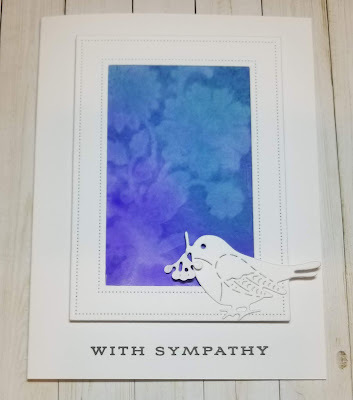 Please go see all the cute cards from the design team. 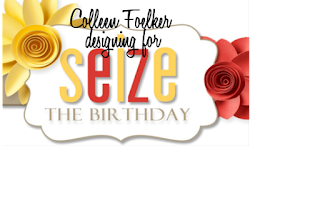 Seize the Birthday ~ NO TOPPING! Hi friends! 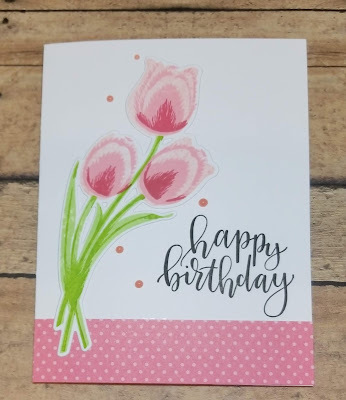 Welcome to another Seize the Birthday Cahllenge where we do NOT have a topping, so you can make any kind of birthday card! 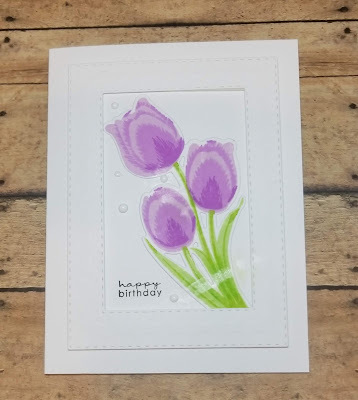 Well, I couldn't resist another "springy" card, especially since my BFF gave me a couple of wonderful Altenew cards with flower stamps! These flowers are called "Stunning Cosmos". 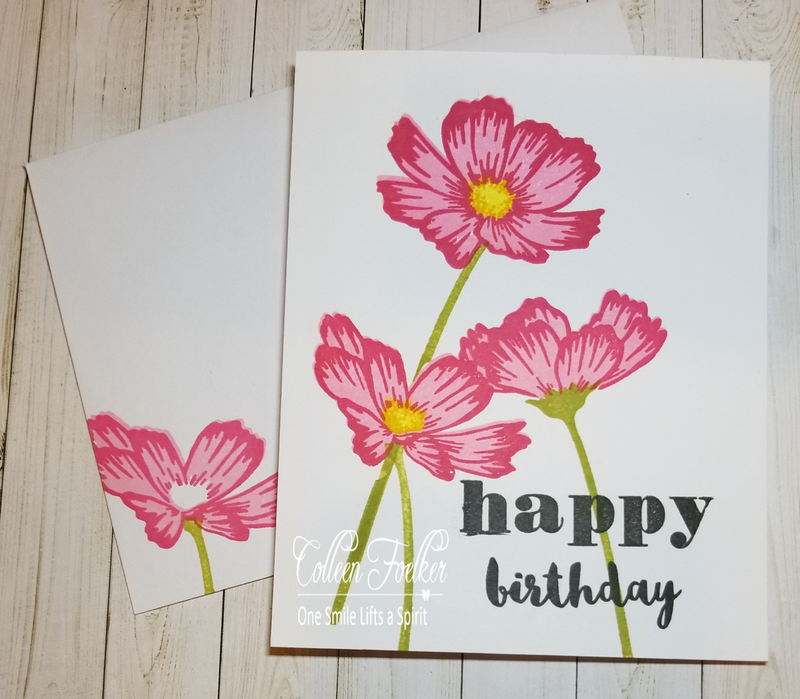 I LOVE the cosmos flowers, IRL they are so showy and tall blowing in the wind and their colors are gorgeous! 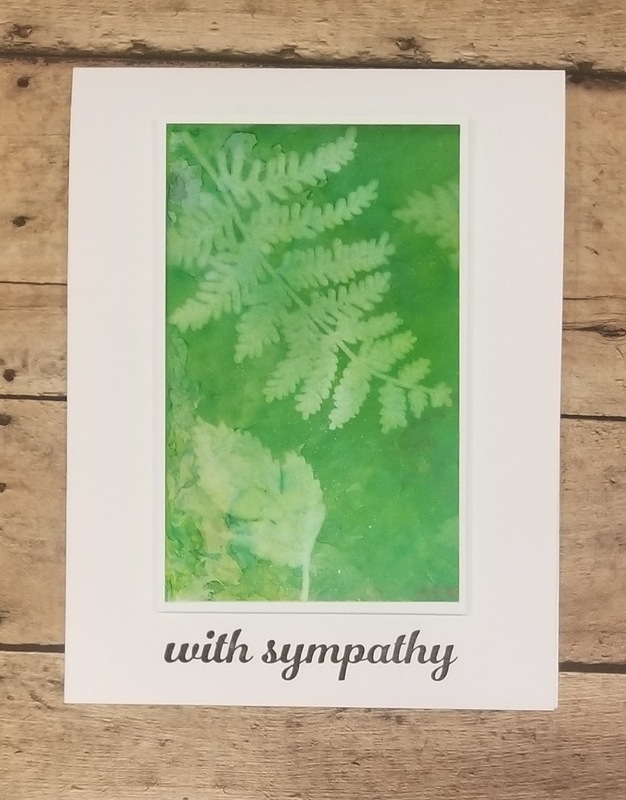 Thanks for stopping by and having a look, I hope to see you in the gallery playing along with any kind of BIRTHDAY card! 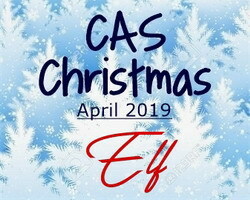 Nance is our hostess for the CAS Christmas challenge this month and she wants to see an elf on our Christmas card! 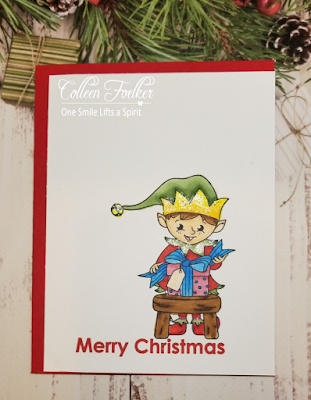 I couldn't resist those cute little elfs from MFT Santa's Elves! Remember to keep your card clean and simple! Now go check out all the inspiration from the rest of the design team! 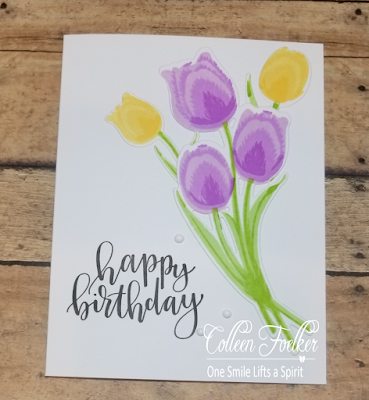 My friend Linda had seen some posts on Kristina Werners blog showing the different blends of the distress inks and she made some cards. 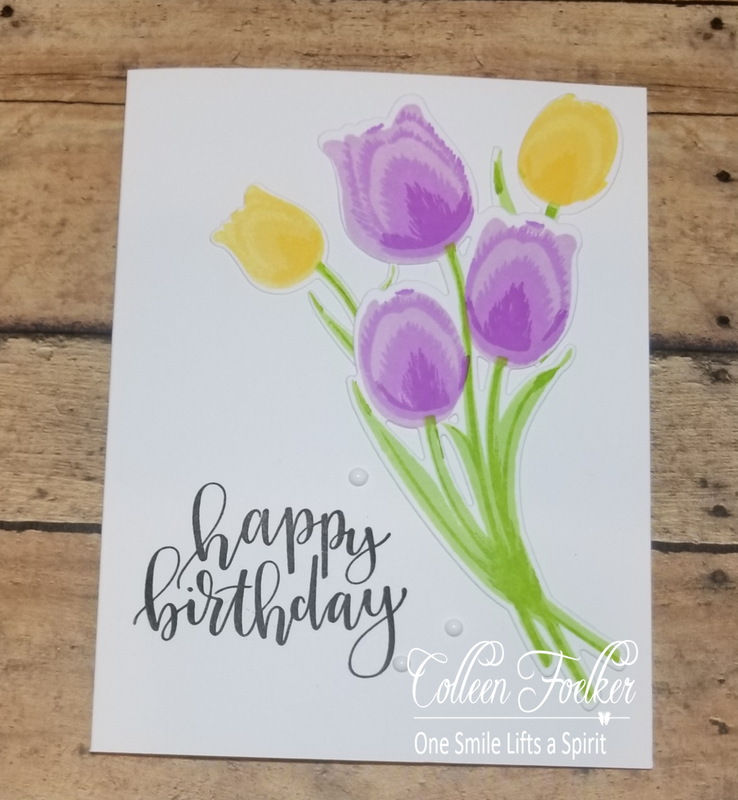 So we took some of her color combos and I made some cards too. 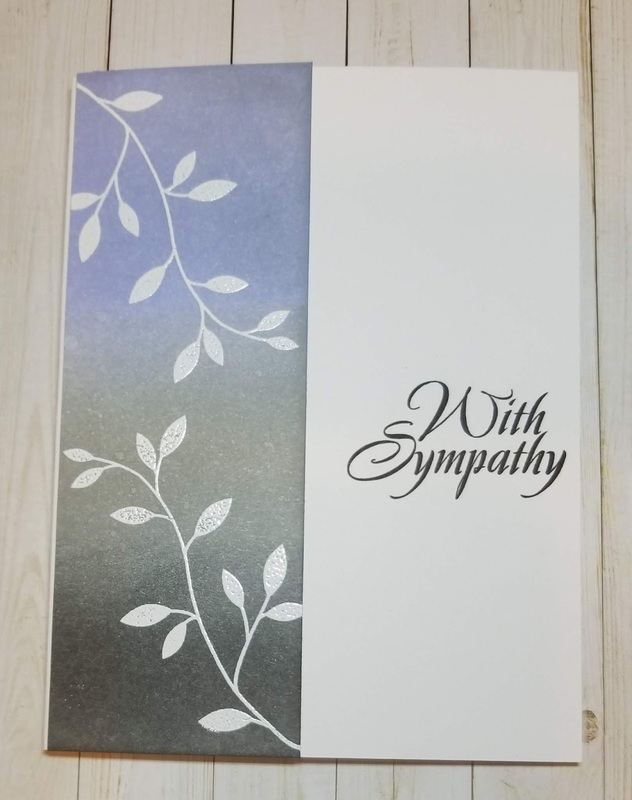 We both needed masculine cards for every occasion, but we started with sympathy. This was a quick and easy way to make double the cards! 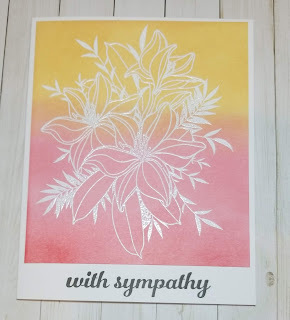 After sponging on the distress inks and letting them dry, I white embossed an image. 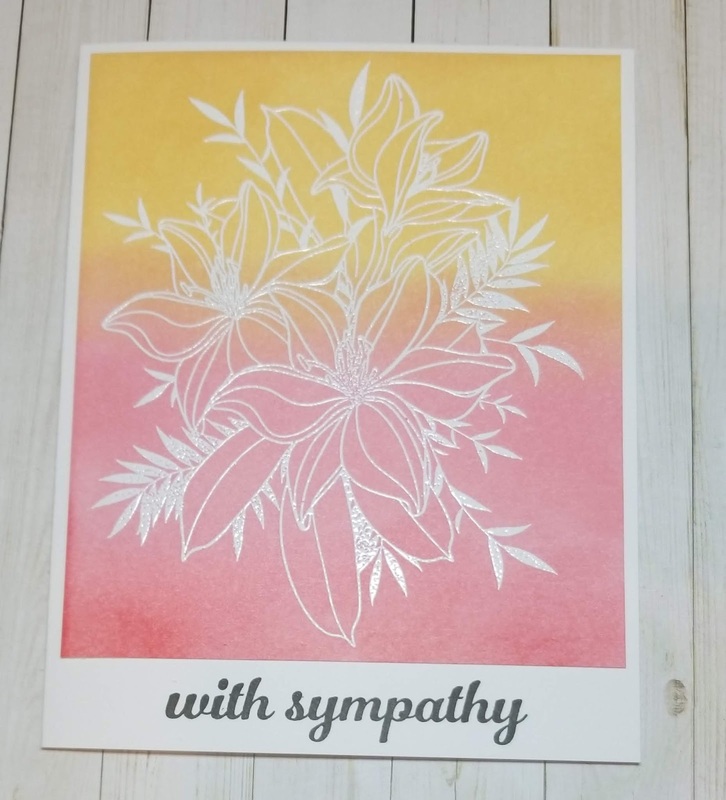 I used PTI Turning a new Leaf, but I also used PTI Autumn Stylized leaves. 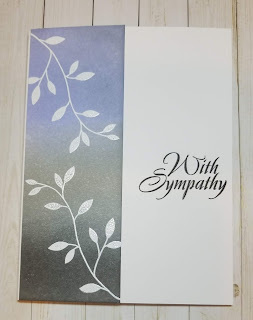 I just cut the paper in half length wise so I could get two cards out of each blended sheet. 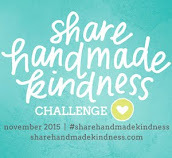 It is so nice to have a friend who shares ideas and helps to inspire me. My stash grew quite a bit with her visit! Hi friends! 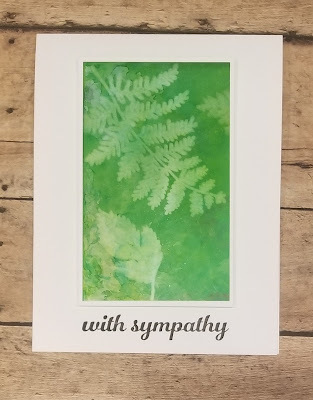 My friend, Linda came down for 6 days and we played with some alcohol inks (and even a couple of the new pearl alcohol inks). and we did some distress blending. And I got to play with some new stamps that Lin gave me for my birthday! 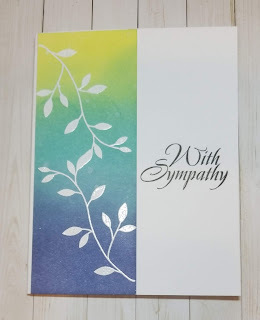 Before I show some of the cards I put together I wanted to give everyone an update on my daughter Dina who is once again battling lymphoma for the second time, however it is a different kind. 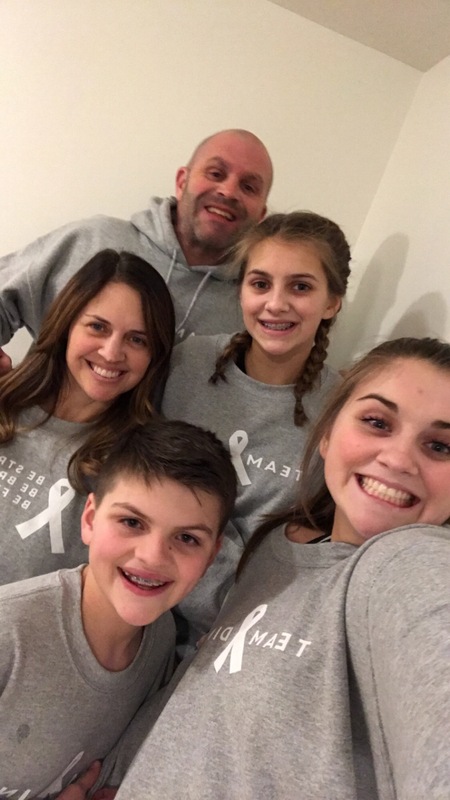 She completed 5 of the 6 treatments, each one required hospital stays of 4 - 6 days. When she went in for her final treatment they discovered her platelets were extremely low and the doctor would not give her the chemo. They did give her blood and then sent her home. 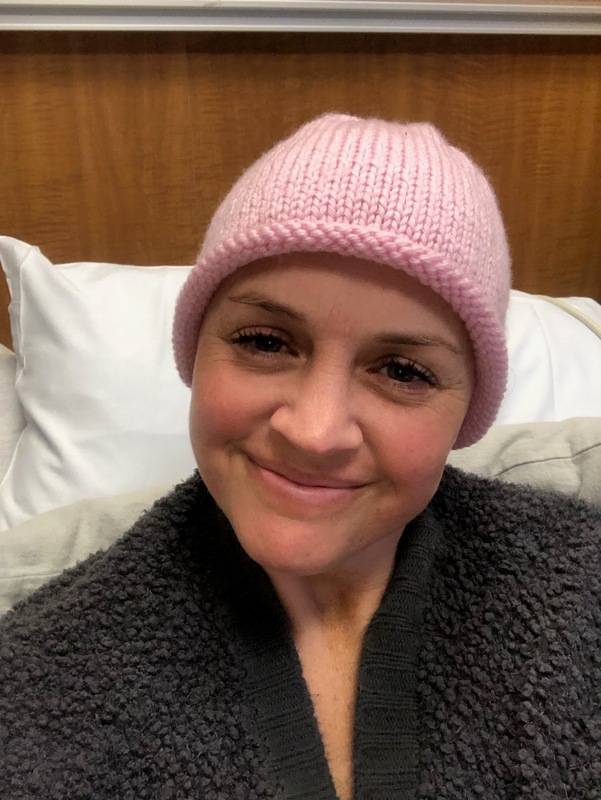 Two days later they brought her back in and her platelets were even lower, this time they gave her a unit of platelets and admitted her into the hospital and when they tested her the following morning, they had gone down again. The doctor was very concerned that there was something going on and didn't want to give her artificial platelets, she wanted her body to make them. 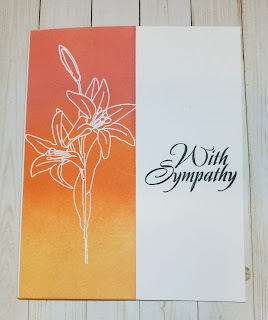 It was possible that they would need to do a bone marrow extraction to see what was going on...she cried in the office when those words were spoken. It is quite painful and she had that done back in 2011 and was NOT looking forward to doing it again. They sent her home again. She was back in the hospital yesterday, Thursday, to have blood drawn and her platelets were UP and almost to the normal number! So she is good to go for her final chemo treatment. She checked in today, Friday, when they called and said they have a bed for her! 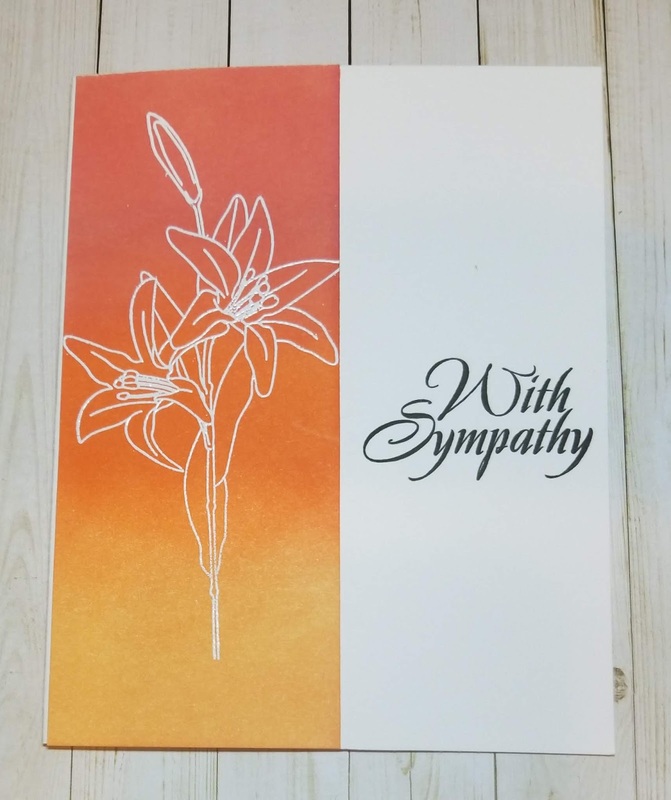 We cried tears of joy when she gave me the news about her platelets improving. This is a grueling treatment with 5 different drugs given one at a time for 20 hours each. She will also have another lumbar puncture to be sure none of the Burkitt cancer cells got into her spine and up into her brain. She has to wait a month before having a PET scan to see if they got it all, keep praying friends that she is all clear and that she doesn't get this again! Phew, once in a lifetime is enough, but twice? That is too many times! And wearing a cute hat that a friend knitted for her. 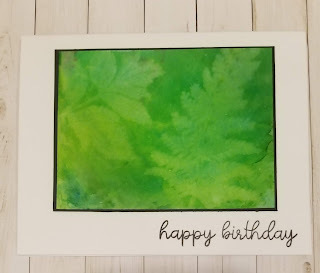 We used alcohol inks on a piece of Ranger Foil Tape Sheets (has adhesive on the back), then I ran it through a cuttlebug embossing folder. I used an MFT Peek-a-boo stitched window frame. This card and the next were made applying the alcohol inks, then "lifting" with the alcohol lift ink. 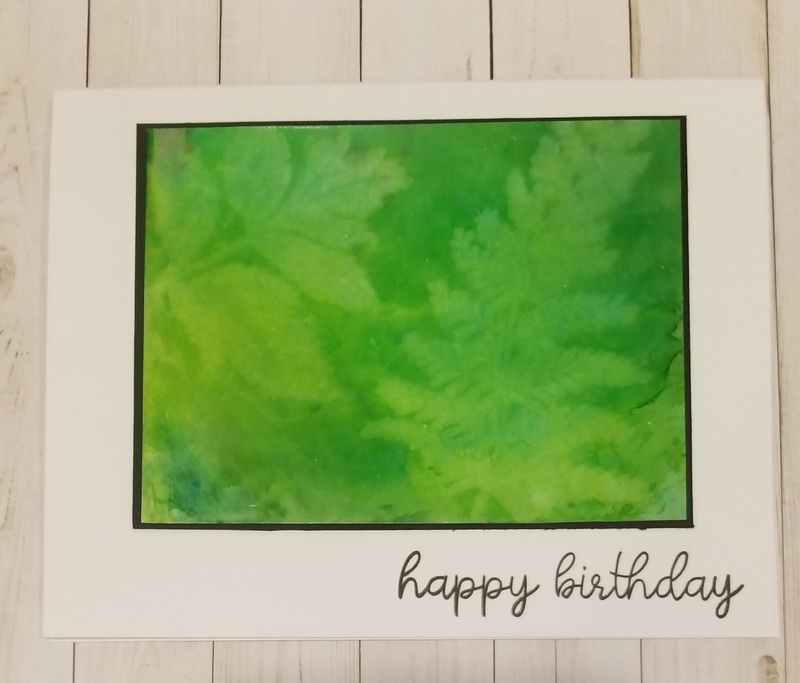 I used the leaves from PTI Meadow Greens. This card I used PTI Lace Bouquet and was happy with how it turned out. The bird die was a gift from Bonnie for my birthday! This last card was left over from the sympathy card above and thought I would use it for a masculine birthday card. Stay tuned for more, we really inspired each other and it has been so long since we both have had the time to spend all day playing. I have had other people on my mind, worrying and praying takes time friends and it kind of zaps the mojo right out of you! But I think the prayers have been heard, we will know for sure in May! 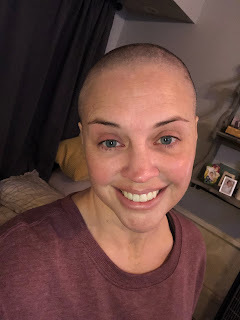 thank you for hanging in there with me and reading through this post and most of all thank you for the prayers! Hi friends, I know I have been missing and I feel bad about that...too much on my plate I guess. However I have a card for this challenge and it is an easy one, the host is looking for a spring card for our Seize the Birthday Challenge! 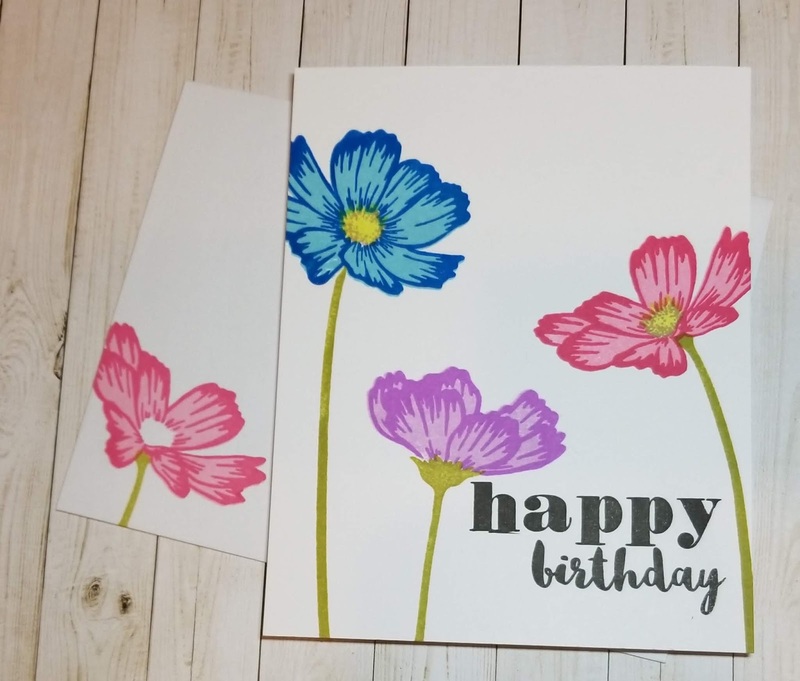 The topping is spring, but you are always welcome to make any kind of a birthday card! tulips in the yard! This is PTI Tulip Time stamp set. 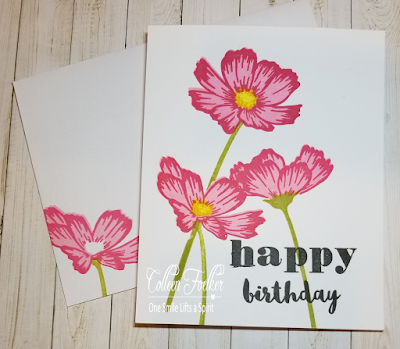 While I had them out, I went ahead and made two more birthday cards. The last card I got a little bit in a hurry and before my nuvo drops were dry, I touched it! GASP, I spread the nuvo drops across the stems with my finger. Now in real life it doesn't show up very much, but boy take a picture and it sticks out like a sore thumb! 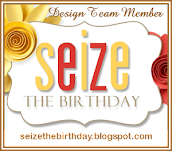 I hope you will join us at Seize the Birthday for this challenge! I am a grandma of 6 and live right next door to three of them...so I get lots of visitors. 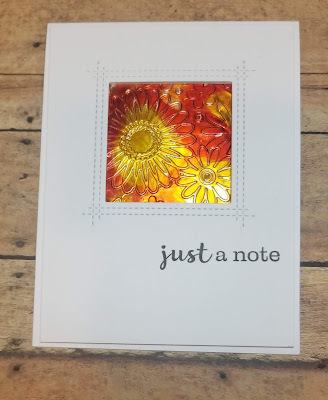 I love to stamp and color and create paper crafts. I have shared this love with at least one granddaughter so far! Scraps of Life by Scrappymo! Don't forget your self exam! 2011 Design by Loll Thompson - 2016. Simple theme. Powered by Blogger.